Shopsmith's Gift Cards are easy to give - and they're always well received. They are the perfect solution when you just can't seem to find the right item or you need a last-minute gift. Recipients can redeem them online, over the phone, or by mail. You will automatically receive an e-mail containing a copy of the Gift Card (personalized by you) that you can then forward to anyone you want to send the perfect gift to. You can even print it out and hand it to your recipient in person! Purchase Your Card Now ! You can check the balance of any existing Shopsmith Gift Card by entering the card number and PIN Number here. 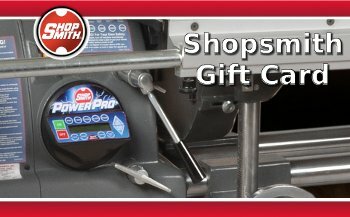 You can change the PIN number of your Shopsmith Gift Card to make it more memorable to you here.